Some things will remain a mystery forever, like why is Allen Ginsberg leaning on a stick in the background of the Dylan video below? I was thinking of making meanings recently when I was with a 12 month old baby on the beach. The sand was packed: there were barbecues and music and beach volleyball going on (this was not Copacabana, but Clacton: you should check it out sometime.) The little fellow had never been to the beach before, and the whole experience couldn’t have made any sense at all. However he wasn’t bothered, because he’d had his lunch, was with his family and had a plastic bucket and some pebbles. So for the next 15 minutes he was able to tune everything out around him and give his undivided attention to something that really made total sense: putting stones in his bucket, giving them a shake and then taking them out again. The only way I can find to explain how children learn to talk is that from birth they are driven to make sense of everything around them, and particularly communication: both non-verbal and verbal. Gazing at mum’s face and listening to her talk is the start of a journey that for most children is mostly over around three and a half years later. By then, to all intents and purposes, they have all the communication skills they will need: apart from some fine tuning of pronunciation, grammar and a lifelong expansion of vocabulary. Our drive to make sense continues throughout life, because the world is a fascinating place, and the people in it (including Bob Dylan and his lyrics), are the most fascinating things of all. However, to the child with autism, the world, and especially the people in it, are far from fascinating. People often seem quite terrifying. You will see children with autism involved in obsessive repetitive behaviour: throwing objects, flapping their hands, spinning round objects, opening and shutting doors and switching lights on and off. My observation is that these activities make sense to that child. They may, in fact, be some of the few things in the world that do make sense, and for that reason they provide a sense of intense security and wellbeing. There are times when these behaviours are less evident, and sometimes when they increase. My observation and interpretation (and it’s only an interpretation: yours may be very different) is that these behaviours increase when the child is particularly anxious. We all get anxious, and at these times we are likely to do something that looks a bit odd. One of the greatest singers of all time admitted that when she is nervous and uncertain she chews the inside of her lips. She knows she shouldn’t do it, but it has become an automatic reaction to pressure*. Detectives, and detective fiction writers, are often aware of someone feeling anxious by the little tell-tale signs: playing with your wedding ring, scratching your forehead, rubbing the back of your neck, touching each fingertip against the thumb of your right hand, sucking your pen or biting your fingernails. None of these actions mean anything, but subconsciously they provide us with security. Likewise adults in solitary confinement or deprived of stimulation will begin rocking, swaying and pacing up and down. I’m sure they don’t consciously decide to do this, but it must, in some way, provide comfort and security. If we believe that these types of repetitive behaviours have meaning to the people who engage in them, then not only can we gain insight into how the world must feel to them, but we can begin to communicate with them. Intensive Interaction is an approach developed from research into very early parent-child interaction, and is used to make connections with children, teenagers and adults with severe additional learning needs. Detailed analysis of mother-infant interaction shows that in most cases, the baby makes an action or sound, and the mother responds by copying what the baby has done. This encourages the baby to repeat the action or sound. Using this understanding, practitioners working with people with severe additional learning needs are able to communicate with individuals who otherwise seem very difficult to connect with. This is demonstrated in a very powerful video, Intensive Interaction showing practitioners with youngsters with very intense repetitive behaviour. Practitioners are encouraged to copy exactly what the youngster does, including all movements and vocalisations, without interpreting what the youngster is doing. The DVD shows both people beginning to use synchronised movements, as well as communicating with each other. It’s as if (and this is an interpretation of mine) the youngster is thinking, “That person is doing the same things as me. That has meaning.” I have used Intensive Interaction and have experienced communication with children who to all intents and purposes appear locked into repetitive actions for most of their day. It helped me to see the world through their eyes, as well as begin to communicate in a way that was meaningful to them. It’s a very powerful experience. 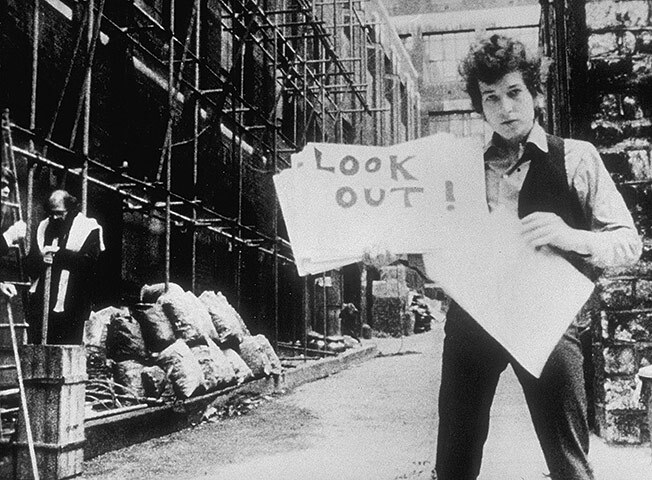 So from making meaning from Bob Dylan we have come to help people with severe and profound learning needs make sense of what must be a very bizarre world. Bob Dylan may not be as cool as he used to be, but the music and images and feeling of incredible hipness and mystery in his songs live on: whether sung by himself or other people. Watch Soluna Samay and her dad Gee Gee Kettel busking in Bergen and see if you agree. Thank you for taking the time to read my blog posts. It’s time for a summer break, and if you are having one, I hope you have a happy time. If you are working over the summer, I hope that is a happy time too! I’ll be back in early September. * We are, of course, talking about Kylie. Informative, as ever, Michael. I feel the need to find a child with repetitive behaviours now, just so that I can observe and interact. Thank you. Watch any baby from 10 months, or anyone on the receiving end of harsh questioning from Jeremy Paxman to see children exploring schemas to expand their minds, and adults trying to defend themselves by all the little movements we do to try and keep ourselves calm while under fire! So what record and book would you take on a desert island?? As Michael implies, most children develop language without difficulty. Interaction, relationships, sensory experiences and acting on objects help most children to develop into master talkers and communicators by the age of 3! For the 1%+ of children with an autistic spectrum condition (ASC), their language and communication development is more complex. We know that the language and communication of each child with ASC is unique. While much is written on ASC to help parents and teachers support the child, the recently published book “The Reason I Jump” by Naoki Higashida,a 13 year old boy with ASC, gives us access to his world and helps us understand language and behaviour that can appear nonsense and unintelligible to us on the outside. I hope this book will help you to more fully understand the language and communication of the next child you teach with ASC.